November, November. You can be cruel, with heavy rains and crazy fluctuating temperatures. But I’ve been not-so-patiently awaiting your arrival, as during your days I will be reunited with the city we all adore, Firenze. So until my trip, I’ll be crossing days off my calendar and stalking you via this webcam of Piazza Signoria. A special thank you to the darling that rigged this thing up, because it offers all of us that can’t always be in Florence a live window into our very favorite space. This event lineup is dedicated to you, piazza-camera rigger. Ok, so we’re cheating a bit here. Yet this Halloween party makes it on our list, because what better way to usher in November 1st? Get ghoulish at Le Murate, which we’re sure is no stranger to a ghost or two. But the mood here will be more upbeat than disturbing, with Ragazzi Scimmi playing dance tunes throughout the night. The festivities don’t kick off until 10 p.m., so head out for a pre-party cocktail and then expect to shake it like a demon’s possessed you into the wee morning hours. For more info, check out the Facebook event here. You know what’s great about Florence in November? Now’s the time that the crowds (finally!) start to thin. Locals can reclaim their city, and those of us that are lucky enough to visit during this time of year will gladly layer up in order to explore the museums half-empty. All of the above makes this #Domenicalarte one not to be missed. For a list of places you can peek into, click here. Oh, and, side note: If you really want to be all “Hannah & Meg” about it, this open Sunday coincides with All Saints Day. Meaning, why not plan your own saintly scavenger hunt across a few museums? Take photos with all the ones you find–but once you take a photo of a saint, you can’t take a repeat photo of that same saint, even if it’s in another work of art. Like, no samesies on St. Stefano paintings, y’all. If you’re crazy enough to do it, please shoot us some photos of your adventure on the town. We’d LOVE to see them! There are a lot of things that Italy does well, but perhaps one of its crowning achievements is its dedication to seasonal, artisan markets. November will host two great ones: the Wool of San Martino organic market on November 7th and 8th, and the New Oil (“olio novo”) organic market on November 15th. 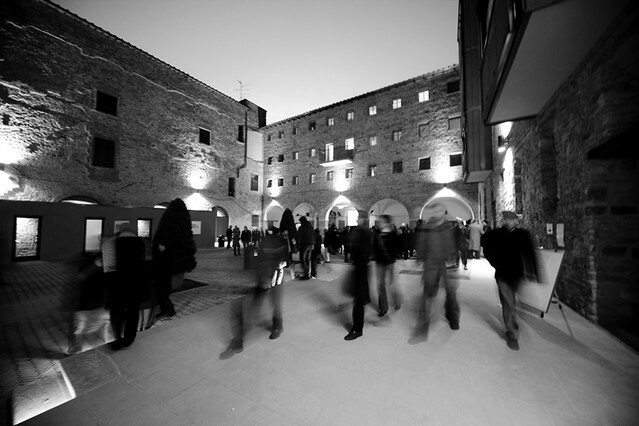 The first will be held in Piazza Santissima Annuziata (a space that doesn’t get enough attention, in our opinion). The second will be held in Piazza Santo Spirito and promises the wealth of a recent olive harvest that is sure to delight your taste buds. Information about all fierucola markets can be found here (and don’t forget to check out our regular market round-up). Every year around this time, Florence kicks off a movie series that would delight any cinephile: 50 days of international cinema, headquartered at our favorite movie theater of all time, the Odeon. Now, yes, you have to buy tickets to many of the films. But hang on there! First, the festival does a great job of offering multiple discount tickets and 2-for-1 offers–check them out here. Second, for those true freebie junkies, Palazzo Strozzi is hosting a free screening of Van Gogh, in conjunction with its current show, Divine Beauty: From Van Gogh to Chagall and Fontana, on November 24th. Admission is free until full; for more details, visit here. Crowds will snake their way past the city’s top monuments for this year’s 32nd running of the Florence Marathon. 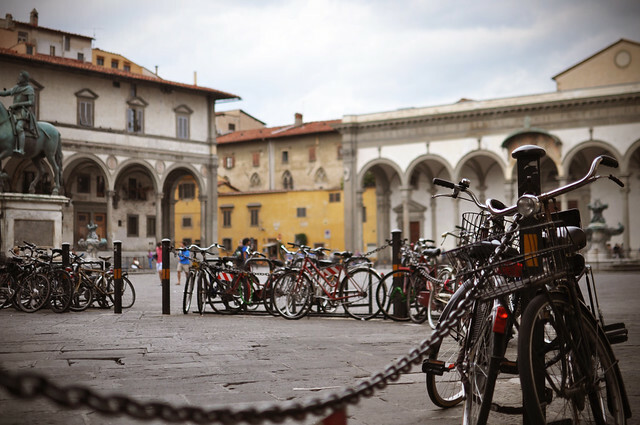 Even if you didn’t think to bring your running shoes to Florence (or aren’t up for a leisurely 26.2-mile stroll), we’re convinced cheering on from the sidelines will still max out your endorphins without fully taxing your form. Plus, moral support is the only payment required for observing all the action. If you’re hoping to circumvent the crowds, here’s the route to avoid today. Ok, here’s wishing for a wonderful roll into the holiday season. And I hope to see some of you soon! I thought you might be interested in this talk (in English) at the Dante Society. I caught the one in October on Purgatorio and it was fascinating. Wednesday, November 11th, 5.00 p.m.
grazie david! we’ll add it to our calendar! Thanks for the update. We’ll be in Firenze for the free movie screening, so will check it out and send you info on it.